Yesterday, Boeing reported Q3-2011 revenues and earnings, but the real headline concerned a long awaited update on the company’s 787 Dreamliner and other commercial aircraft delivery schedules. Readers will recall that in late August, Boeing finally achieved its long overdue initial milestone for the 787, formal flight certification and first customer delivery. While the Q3 financial headline was a rather respectable 31 percent increase in Q3 profits, far exceeding Street expectations, the grilling for Boeing executives during the earnings briefing concerned long-term outlook and commercial aircraft production volumes. Boeing executives communicated production volumes that combine 787 and 747-8 deliveries, making it rather difficult for analysts to differentiate each. In our July posting which reflected on Boeing’s Q2-2011 earnings report, we noted commentary from Flightblogger which speculated that Boeing’s new lumping of combined numbers just adds to additional speculation as to other stress points in the supply chain. At yesterday’s briefing, the number cited was 15-20 new deliveries of both 787 and 747-8 aircraft for this fiscal year. Last quarter, that number was cited as a combined 25-30 aircraft this year, and thus a slowing has occurred for some obvious operational or design change reasons. Another open question has been whether the devastating earthquake and tsunami that struck northern Japan had any previous supply impacts. What was communicated is that Boeing management is observing “improvements to the quality, productivity and overall condition to the assembly within the production system.” Noted was that 787 production configuration has been finalized, and production volumes are about to transition to a rate of 2.5 airplanes, vs. a prior 2 airplanes per month. 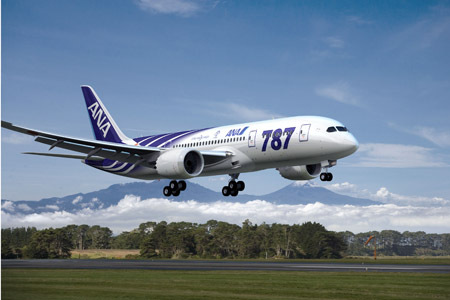 Production and delivery of 787’s is being planned to ramp to 10 aircraft per month by the end of 2013. First delivery out of Boeing’s planned second final assembly facility in Charlestown South Carolina was reported to be on-track for next year. 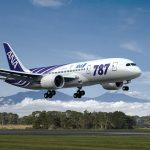 Boeing re-iterated that firm backlog for the 787 remains at 821 units, with an additional 200 contracted delivery options. Also noted was that initial gross margins on 787 program itself is now tracking to “low single digits”, which takes into account the cumulative impact of delays, tooling, and non-recurring costs. Boeing CFO James Bell estimated that the program would reach breakeven by 2021. Read that statement once again- the 787 program will not reach breakeven for at least 10 years, with current numbers. Of other interest for the Supply Chain Matters reading audience is that Boeing estimates that the addressable market for the 787 class of aircraft will be 5000 aircraft over the next 20 years. The first 1100 aircraft represents approximately 10 years of that segment, which leads to the implication that the remaining 3900 aircraft will be produced and delivered in the latter 10 years of the program. One could speculate that since current order volumes have plateaued, these numbers might be overly optimistic. In any case, they represent quite a high volume milestone for Boeing and its associated supply chain partners to achieve, given past history. One other item should be of supply chain community interest. Boeing’s overall inventory level increased by $1.8 billion to a current number of $18 billion. The inventory rise was attributed to 787 work-in-process, supplier advances and tooling. In our Supply Chain Matters Q3 Quarterly Newsletter scheduled for distribution later this week, we comment that aerospace supply chains remain under various forms of stress. In the case of Boeing’s supply chain, there was celebration that after three years of delay and frustration, an important initial milestone has been reached. Yet, when we examine the current backlog numbers for both Boeing and Airbus, and factor their combined needs to now ramp production levels to extraordinary volumes to meet airline delivery requirements, the notion of complete supply chain synchronization, agility and intolerance to disruption, adds so much more to the implications of that stress.